The coastal drive from Melbourne to Sydney or vice versa takes you through some of the most picturesque countryside in Australia, without ever venturing too far from the shore. 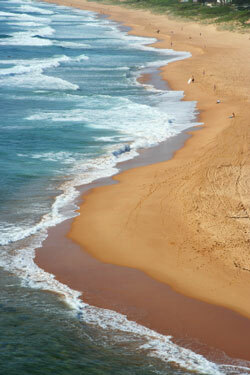 Enjoy lush National Parks, pristine beaches and secluded surfing spots on this five day drive. An early start in Melbourne should prepare you for this decent length drive to Metung through the stunning Gippsland region. If you�ve got time for a diversion then turn south at Foster and visit Wilson�s Promontory National Park, the southernmost tip of the Australian mainland. If not, then continue straight through Foster and onto Yarram. Take a moment in Yarram to savour the historic architecture, or play a round of golf on a course famous for its abundance of kangaroos. Then continue on to the large administrative centre of Sale, through Bairnsdale and onto Metung, a beautiful little town in the heart of the Gippsland Lakes region and close to the infamous Ninety Mile Beach. Metung is an historic village with an easy going coastal atmosphere, steeped in fishing and boating history. Spend the morning exploring the aquatic expanse of the Gippsland lakes, and indulge in some fishing or in the many water sports on offer. If you have time explore the nearby town of Lakes Entrance, a fashionable tourist destination, and then head on to Mallacoota. On the way you can stop in at the Cape Conran Coastal Park, a lush park with lots of wildlife and some very pleasant bushwalks. And then onto Mallacoota, a gem of a coastal resort town with idyllic beaches and great surfing conditions. Surrounded by the Croajinalong National Park, Mallacoota is a place where you could easily spend a few days if you needed to. Head to the mouth of the Betka River for amazing fishing and stunning beaches, or if you are feeling very adventurous then head out to Gabo Island. Its just a 200 km drive to Central Tilba, so you can have lunch in Mallacoota before heading off. Central Tilba is a beautifully preserved heritage village that is heritage listed. Lush, green landscapes with plenty of gently rolling hills provide a myriad of bushwalking opportunities, if you can tear yourself away from the unique craft shops and the art galleries in the quaint town of Central Tilba. Before setting off to Jervis Bay pay a visit to Tilba Tilba, a smaller village just to the south of central Tilba that is also heritage listed. Call in at Pam�s Store, an old fashioned general store where you can get just about anything you need. The drive to Jervis Bay goes right up the coast, and through popular tourist resorts such as Batemans Bay and Ulladulla. Jervis Bay is known as the jewel of the NSW South Coast, and indeed it has everything to offer the coastal holiday maker. The bay itself is a National Park and is said to have the clearest waters and the whitest sands in the world. Surfing is popular, and you can also expect to see whales and dolphins in the waters of the bay. There are also a number of National Parks inland, and the large number of small settlements around the bay mean you are spoiled for accommodation choices. The last stretch of your journey is straight up the coast to Sydney. You start to leave the more peaceful and expansive country settings behind the closer you get to the state capital. Stop in at Kiama, about an hour and a half of Sydney, for a lunch or a snack, and perhaps visit the landmark blowhole that the town is famous for. After that its straight along the highway onto the bright lights of Sydney, unless of course you wish to divert via Wollongong. You will need to spend some time in Sydney to fully appreciate the famous attractions such as the Opera House and the Harbour Bridge. There are a number of caravan parks and the like you can stay in throughout the city.